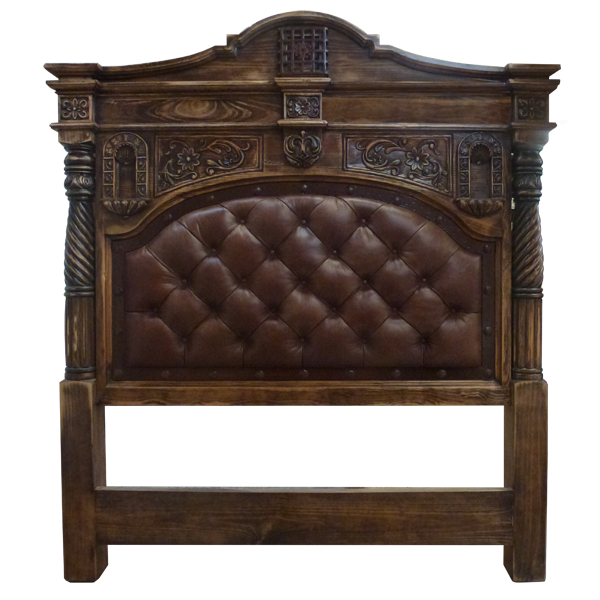 Embellish your bedroom with the exquisite, hand carved details and the impeccable, button tuft design of this glamorous, handcrafted, Western style headboard. The front of the solid wood, framed headboard has a large, padded, geometric design with a curved top. The padded front is upholstered with rich, brown, full grain leather, and the leather is adorned with a gorgeous, button tuft design. The junctions of the leather are double stitched together for extra strength and durability. Adjoining the leather panel is a hand forged, iron border, which is accented with intermittently hand tacked, hand forged, iron conchos. 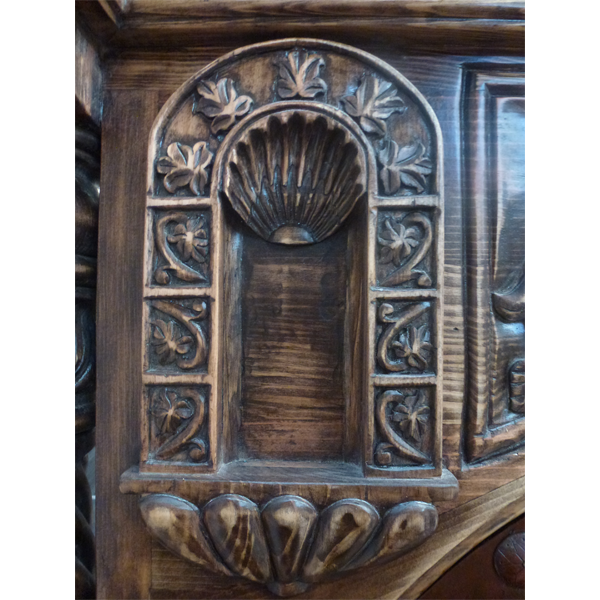 In each top corner above the padded front is a small, hand carved, oval alcove, with a beautiful, hand craved shell in its center. The area between the alcoves is enhaced with exquisite, hand carved, floral and scroll designs. The headboard has a straight, top crown molding, and above the molding is a lovely, arched crest with curved sides. 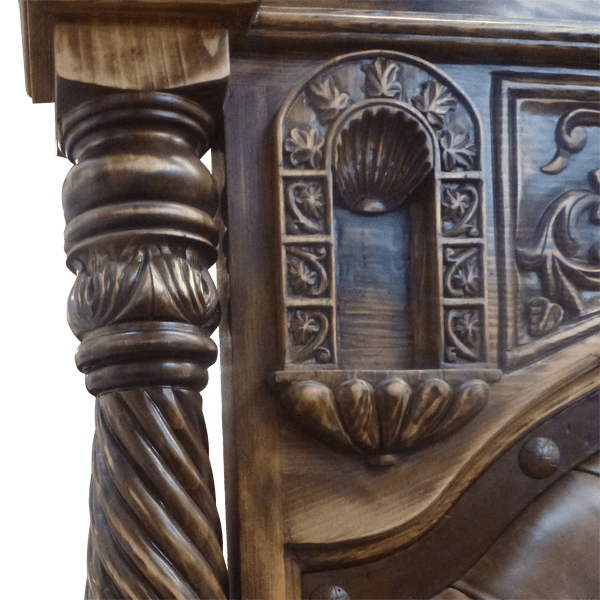 The headboard is framed with spectacular, hand turned columns. The lower part of the columns have hand turned, fluted designs, and the upper part of the columns have hand turned, spiral designs. 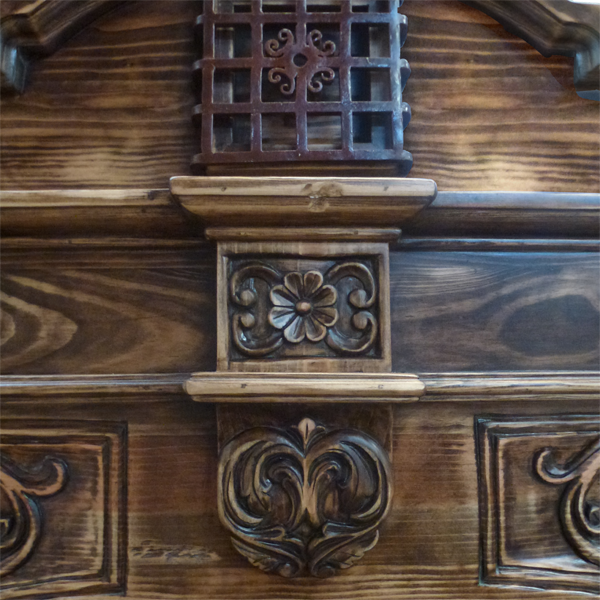 The headboard rest on square cut legs, and it has an antique finish. It is made with the best, sustainable, solid wood available, and it is 100% customizable.